If the root node of the currently selected material is not positioned at (10,10) it will be moved there, and all other nodes will be moved accordingly. Various dialogs tell you what's going on, and there's an option to cancel without changing anything. As with all my scripts this was written for my own use - it's intended purpose is as stated above and it seems to work as intended. As always you use it at your own risk - a sensible precaution is simply to save your scene before running the script! Morkonan (3 years ago) Inappropriate? This keeps me from cursing when in Poser's Material Room... Thank you very much! I find I'm using this all the time now. 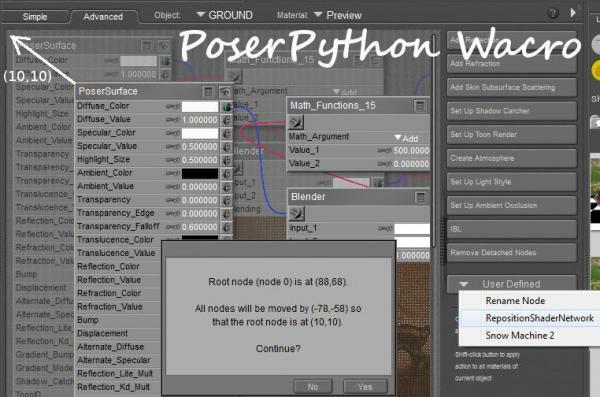 Did you realize that if you add a new node when you're scrolled then Poser moves allthe other nodes? That's why when you go back to the material it's in the wrong place. This fixes it!